Bayer spokesman Dr Julian Little told the BBC’s Farming Today that misapplication is highly unusual. “It is an extremely rare event and has not been seen anywhere else in Europe,” he said. Clothianidin, like the other neonicotinoid pesticides that have been temporarily suspended in Germany, is a systemic chemical that works its way through a plant and attacks the nervous system of any insect it comes into contact with. According to the US Environmental Protection Agency it is “highly toxic” to honeybees. This is not the first time that Bayer, one of the world’s leading pesticide manufacturers with sales of €5.8bn (£4.6bn) in 2007, has been blamed for killing honeybees. Bayer’s best selling pesticide, imidacloprid, sold under the name Gaucho in France, has been banned as a seed dressing for sunflowers in that country since 1999, after a third of French honeybees died following its widespread use. Five years later it was also banned as a sweetcorn treatment in France. A few months ago, the company’s application for clothianidin was rejected by French authorities. Bayer has always maintained that imidacloprid is safe for bees if correctly applied. “Extensive internal and international scientific studies have confirmed that Gaucho does not present a hazard to bees,” said Utz Klages, a spokesman for Bayer CropScience. Last year, Germany’s Green MEP, Hiltrud Breyer, tabled an emergency motion calling for this family of pesticides to be banned across Europe while their role in killing honeybees were thoroughly investigated. 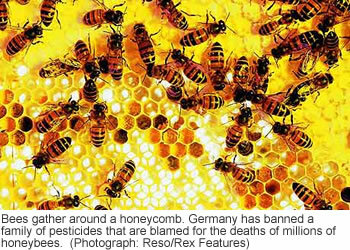 Her action follows calls for a ban from beekeeping associations and environmental organisations across Europe. This page contains a single entry by Toni published on May 26, 2008 4:11 PM. Critical Pesticide Program Cut was the previous entry in this blog. WEIGHT LOSS HEALTH FREEDOM UNDER SERIOUS ATTACK is the next entry in this blog.